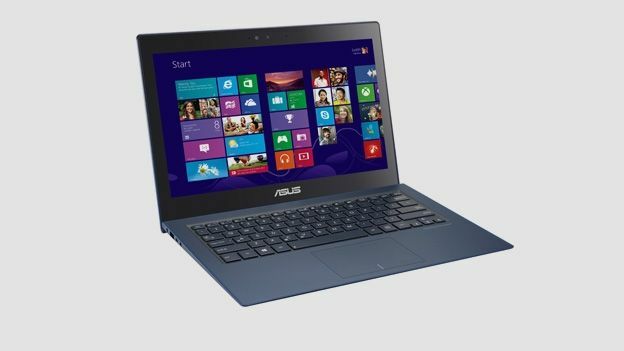 Can the slimline Asus Zenbook UX301LA compete with the MacBook Air? Apple's MacBook Air has been the top dog among super-light laptops for years now, but Asus' Zenbook line has been a solid alternative for those who want sleek styling with Windows OS. If you're after a top-spec ultrabook, but you don't fancy the idea of lining Tim Cook's pockets with your hard earned cash, then the Asus Zenbook UX301LA might be of interest. The brushed metal look of the Asus Transformer Prime is gone, replaced by a plastic and crystalline glass lid. It's not aesthetically offensive by any stretch, but doesn't quite scream the same level of quality as its ancestors. The body itself is just 15.5mm thick at its thickest point when closed, which makes the new Zenbook one of the thinnest laptops we've ever set eyes on. And despite the plastic it really is nicely built - although we expect it wouldn't take quite the same pummelling as the aluminium alloy MacBook Air or MacBook Pro. This Zenbook is - as a result - incredibly light at just under 1.4kg, and still pretty sturdy on the whole despite the lower grade materials. You'll be more than comfortable carrying this around all day without feeling as though you're dislocating a shoulder. The keyboard is very nice too, easy to use with a satisfying mechanical click to each key and subtle auto-adjusting back lighting. Also standard is a front-facing 720p, 30fps camera for video calls and selfie opportunities. It's not setting the world alight but we were happy with the performance. One of the best features of the new Zenbook is the beautiful 2,560 x 1,440 QHD display, which handles movies, photos and web pages with ease. Along with the Chromebook Pixel and the MacBook Pro with Retina display, this is one of the nicest screens we've seen on a laptop. We did find that the screen - though razor sharp in clarity - is rather reflective thanks to the glossy coating, which is annoying if you're trying to use it outdoors, or even indoors with lights on. The viewing angles are still pretty good on the whole though. The most impressive thing about the screen is the touch sensitivity. The Zenbook isn't the first laptop to play with the idea of a touch-sensitive display, but often the size of these screens makes them inaccurate and awkward to use. The Zenbook is about the best of the lot so far, the screen picks up swipes and taps accurately, making it genuinely useful for navigating menus and even photo editing and web browsing. As you'd expect from a high-end Ultrabook, the Zenbook has a 4th generation 2.8Ghz Intel i7 under the bonnet, but also finds room for a mighty 8GB of RAM. For this sort of price you'd expect to be well future-proofed, and Asus has you covered in terms of power. Alongside the CPU is Intel's HD Graphics 5100 on-board GPU. It has no problem handling HD video, but it does struggle with intense gaming and photo/video editing. If you're a heavy media user, you should probably be looking at something with a dedicated GPU from nVidia or aTi. Thankfully the UX301 has no problem staying cool. As with many ultrabooks we expect to feel the heat of a thousands suns on our groins an hour into a movie, but the Zenbook is a cool customer. The battery performance is the most disappointing aspect of the UX301 for us. We got about 5 hours out of the battery on a full charge while watching a couple of movies, browsing the web and editing some pictures. This isn't terrible on its own, but it doesn't stack up well against the likes of the Toshiba KiraBook and the MacBook Air, which both manage at least an hour more under the same conditions. The UX301 is available with a 128, 256 or 512GB SSD inside - it's not huge, but combined with cloud storage it should be enough for most. If it's not, you probably want to consider something a bit bigger and heavier like the MacBook Pro. Asus has enlisted the help of Scandinavian audio specialists Bang & Olufsen for the built-in speakers. Laptop speakers tend to be disappointing, but these sound pretty good on the whole. You get plenty of ports including two USB 3.0, micro HDMI and mini Display Port along with the usual mic and headphone jacks. USB 3.0 is more than welcome, but many other ultrabooks on the market manage to squeeze three USB ports into the body, compared to the Zenbook's two. And while we understand the need to minimise ports, having micro HDMI and mini Display Port means you'll have to carry around the adaptors to use them. There's a lot to like about the new Zenbook - it's extremely light and portable, and packs masses of power in that tiny frame, even if you discount the lack of a true dedicated GPU. As a laptop, it's as powerful as anything on the market. That said, it is underwhelming in the battery department and the price is pretty steep compared to the competition. You can pick up a similar specced MacBook Air for less money - still convincingly the best lightweight laptop you can buy - and at this price bracket, the Zenbook doesn't separate itself enough from other Windows 8 ultrabook competitors.